The first new music from the reformed King Crimson line-up has appeared online. Yesterday the DGM website unleashed a one minute fourteen second segment of the track Venturing Unto Joy Pt. 1, recorded at rehearsal at Elstree Studios by four of the new seven man King Crimson line-up. 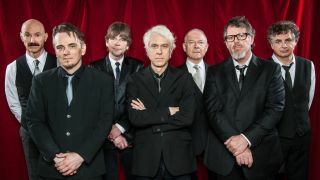 Featured are Robert Fripp (guitar), Tony Levin (bass) and drummers Bill Rieflin and Gavin Harrison. King Crimson kick off their 2014 Us tour on September 9 with dates running through to October 6. No European or UK dates have been announced thus far.